As parents, providing quality education to our children remains our top priority. Choosing a school implies you are putting your child on a long, winding path of learning. Thus this path needs to be selected carefully and wisely. However, this is often easier said than done. With the rapidly growing number of pre-schools, primary and secondary schools all around us, how do you choose the one that best fits the specific needs of your child? There are many important factors that need to be considered to choose a school for your child. 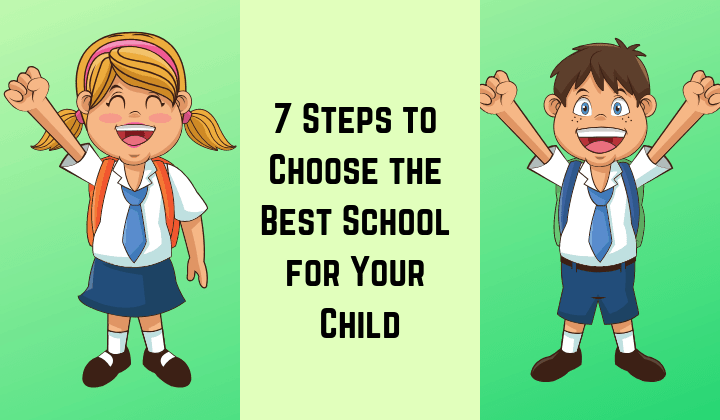 In this article, I will share 7 simple steps that can help you choose the right school for your child to help secure his academic future. It is always advisable to first start looking at the best available schools closest to your place of residence. This becomes necessary from a safety perspective and to prevent your child from suffering the repeated discomfort of a long journey to and fro from his/her school every day. As a responsible parent, you have to consider your child’s comfort and also ensure that the school is close enough for you to reach in the shortest possible time whenever needed. Very often parents tend to enrol their children only in the most expensive private/international schools – assuming they are the best, courtesy their exorbitant fees and an impressive array of hi-tech facilities. This is a common misconception in India and need not be true always. There are several reputed public schools across the country which are not only a lot cheaper but also give a comparable/better quality of education to their students. Besides a quality education is already an expensive luxury in India and there is no need for you to risk potential bankruptcy in your haste to send your child to the – most expensive school – possible. Instead, you need to focus on whether you are getting full value for the money you are paying in terms of quality, safety, facilities, extra-curricular activities and the assurance that the all-round development of your child is being taken care of in the best way possible. 3. Academic & Extra-Curricular Activities. What a child learns and experiences in his/her formative years stays with them for life. Ensuring the school meets the highest standards of excellence in terms of its teachers, teaching methodology, academic curriculum and moral standards should be your biggest priority. Extra-curricular activities like outdoor games, team sports, art & craft, hobby ideas, physical education, dance & drama classes also play a massive part in shaping a child’s overall personality. They can add an extra edge in your child’s capacity for learning and further hone his/her intellectual skills. Hence the existence of the proper facilities and trained staff to facilitate this aspect of your child’s education is equally important. All of the above can easily be verified by visiting the school personally and talking to the principal, teachers and caregivers and taking a tour of the facilities provided. You can also do a thorough background check about the school online and talk to parents and existing students to see what exactly the school has to offer. Would you instead send your child to a school which allows 60 students per class or one that limits the number of students per class to a manageable 20 kids? Obviously, you would prefer the latter option since fewer students per class would allow the teacher the liberty of giving individual attention to each one of her students – thereby optimising the student’s learning capabilities. Research has proved that students tend to learn more in smaller classes, have higher grades and also perform better in their examinations and non-academic activities. As a rule of thumb, one teacher for every 30-35 students per class is an accepted industry norm in good primary/secondary schools. At the Pre-K level, it should be a teacher and two assistants for a class of 10-15 preschoolers. When it comes to kids, a clean and hygienic school environment is a massive priority. As a parent, you need to know if this is actually the case or not. Things like – Are the outdoor games and toys safe for use by children? Is the playground kept clean and tidy? Are the nannies and teachers themselves clean and hygienic? – need to be checked and confirmed personally. Also is the school adequately equipped with a medical bay and staff in case of a medical emergency with a child? Has the staff been trained in basic life-saving and CPR techniques? These are some of the other things you need to look at too. When it comes to the curriculum, most schools tend to follow different paths. SSC – Secondary School Certificate. ICSE – Indian Certificate of Secondary Education. CBSE – Central Board of Secondary Education. IB – International Baccalaureate programme*. CIE – Cambridge International Examinations*. Each board has a different curriculum, system of teaching and focuses on various subjects. You need to assess your child or take the help of a trained counsellor to decide which system suits him/her the best as per his capabilities and interests. And here’s another handy tip for you. An excellent academic program should be practical regarding teaching your child intellectual, social, emotional and motor skills. The use of the latest technology and teaching aids should also play a massive part in your final decision. Always choose a school which encourages modernity and which gives its students, access to contemporary tools and technologies. This factor has assumed added significance today in light of the fact that we see so little of it among kids these days. Choosing a school with a high level of discipline is important to make sure your child imbibes the right values and takes responsibility for his/her actions. However, the methods adopted by the school should be civil. Many studies have shown that a stressful school environment can lead to a decline in the understanding and learning capability of children. As a parent, it is your responsibility to make sure that the school you plan on enrolling your child in, educates children in a free, healthy, stress-free environment or otherwise. Like I said at the beginning of this article – choosing the right school for your child can be a tough, intimidating decision. While the quality of education remains the most important criteria, the opportunity to develop your child’s creative, physical and social skills is also a key attribute that needs to be given equal importance. I hope by reading this article you are now aware of the exact factors that you need to consider in your endeavour to select the right school for your child. Do share your feedback/experiences with us in the comments section below. We would love to hear back from you. Choosing a school in India is very difficult and that too the best one. This article has helped me a lot and is also very informative. Thank you so much for sharing the article. My daughter is studying PRE-KG. As you mentioned in the first point. I followed the same and admitted my child in the school which is just 300-400 meters away from my home. It is very comfortable to her as well as to us. but that is a KG School. As per the current status most of the private schools not admitted the students directly to 1st STD. I am just shocked. 1st standard is the beginning. But it is not possible to admit a child directly in 1st STD.Unless until there is a high vacancy in a school for admission. Child He/she need to completed the KG in the same school then only they will admit the child in 1st std. Also minimum 70000 donation in 99% school also an average fee in 1 Lakhs per Annum. Apart from this there may be an additional fees. I am having two children. I need to save Rs. 30000 to Rs.35000 per month. Because to my children the education cost and the donation will come arround Rs.400000. Please think about it. The person who earn Rs.100000 per month and can admit his children in School. Please think about if he have house and CAR EMI???? How it is possible since he/she not meet the age 18. In 12th standard only he/she can go to school via bike. If they doesn’t have Licence the school itself need to stop them.